The advertising market is currently facing a number of major challenges. The atmosphere has an appreciable effect on the market, because of a stagnant national economy, greater progressing convergence of media, new technologies and business models as well as changing basic conditions. The overall situation of the advertising industry is classified as average „less good“ accordingly to a trend survey of ZAW members. The cyclical trend characterizes the expenditure in communication activities and advertising in particular. Advertising is more than ever viewed as a cost rather than as an investment. An optimal allocation of advertisement budgets and effective response of the audience become increasingly important to the advertisers focus. Traditional advertising media can’t afford these requirements at high scattering losses, uncoordinated messages and a difficult measurability of advertising success. Digital media quality counteract this trend. Despite economic difficulties, the digital outdoor advertising is a steady growth area. IP-based technologies, tracking and targeting as well as mobile internet allow an optimized coordination of advertising messages and transparent billing models. 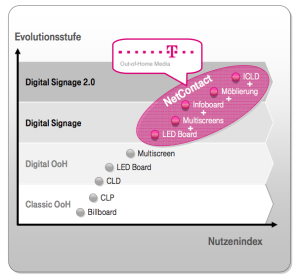 Digital Signage 2.0. considers all these factors and thus provides a modern alternative to traditional advertising media. Digital Signage 2.0. fulfills the requirements of the advertising market through intelligent linking digital media quality with communication technology. The concept „Conversion Tunnel“ by BHM & Company enables in this context, more flexibility in message transmission, more intelligence by linking the advertising and more power due to high conversion rates. Target groups can be identified through the use of a location (eg. Airport) and also addressed time-sensitive. Especially closed locations offer the possibility of an extremely intense approach to customers at high dwell times and long waits. An average of 149 minutes to contact the target group can be guaranteed, running the example airport. Predefined walking distances through the check-in, the security check and the boarding area ensure the contact to the advertising media and allow an optimized strategy to address customers by target groups, repetitive and content coordinated approach of the consumers. The use of different media offers advertisers, besides concerted advertising messages, the ability to address different levels of impact of the consumer. Attention media like the big screen, can generate initial interest, while information media (midsize-screen) on the affective level links this by moving pictures with emotions. By using dialogue media behavioral change can be initiated on the conative level, which will then ideally be completed by the interactivity of the medium in a direct conversion of the customer. Enabling a holistic communication with the consumer observes a significant increase in advertising effectiveness. Coordinated messages give advertisers the ability to form a storyline that binds the interest of consumers. 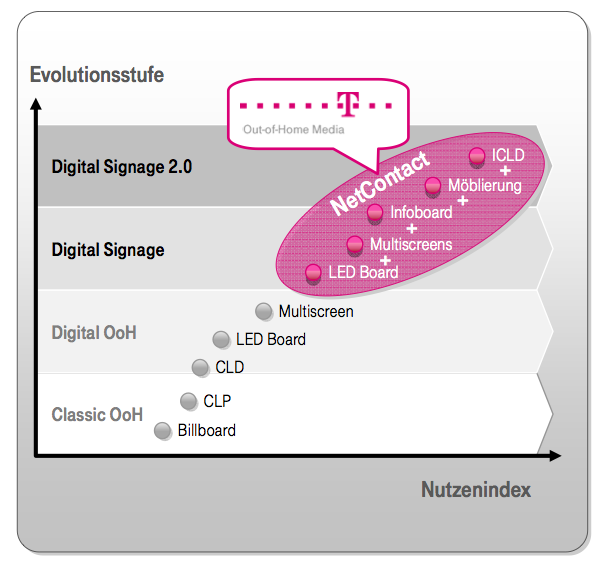 Digital Signage 2.0 provides, next to the given advantages on the consumer’s page, more benefits for advertisers. Services can be charged performance-orientated through the use of digital advertisement. Digital Signage 2.0 provides, from classic models of advertising service „pay per on air time“ to billing models depending on the uses of „pay per use“, significantly greater transparency compared to classical advertising media. BHM & COMPANY sees in the use of digital signage distinctive advantaged for advertisers. The identification of relevant target groups (targeting) in a closed location (captive situation) enables optimized customer approach through time-sensitive placement of advertisement (flexible content management). The campaign and action media use (frequency capping) also allows a targeted message delivery. Performance-orientated business models (tracking) create transparency and measurability of media performance.